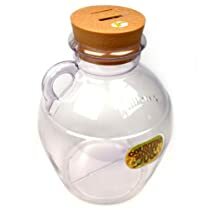 The Zillions Money Jug adds up your coins as you drop them in. It “magically” knows the value of each and every coin. You never have to wonder how much money is in the jar. You can literally watch your money grow in this see-through, unbreakable jar. And when the time finally arrives to spend all that hard-earned cash, just unscrew the top to get your money. Measures 7.75″ x 11″.